Why can’t the U.S. be more like Israel? I’d like to do a forensic search to root out the origin of the latest media meme that, given the mess that TSA appears to be making of the new full body airport security screenings, we should turn to Israel as a model for how to do the job. Chances are that we’ll discover that the meme was created by someone in the MFA or by an Israeli security consultant who stands to make millions if TSA takes the idea seriously enough to hire him. Amid the uproar that airport screening has become too intrusive, some Americans are now asking why the United States cannot do it like the Israelis. ...Why can’t the U.S. be more like Israel? Oh, I don’t know, maybe because we’re a democracy and take civil liberties seriously and Israel winks and nods at the notion. Maybe because we know enough about racial and ethnic profiling to reject the notion especially when you establish it at the core of a nation’s airline screening process. Maybe because we have a more balanced, nuanced understanding of the conflicting requirements of national security and individual liberty. 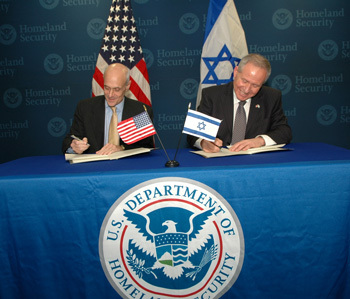 Neo-Pharisees tighten the noose: Jewish Zionists like former Homeland Security czar Michael Chertoff (above left) are profiteering nicely by importing draconian Israeli "national security" methods to America. Integral to the Zionist agenda, the Jewish-dominated, statist-liberal Establishment mainstream media paper the entire Judeofascist police state process over by glorifying Israel and its pharisaic ways as shining examples for America to follow. Looks like treasonous, Establishment Big Government "conservatives" and "liberals" have finally found something they can whole-heartedly agree upon: anti-American and anti-Christian Jewish supremacism. -- C.M.